How does hallux arthritis develop? Cartilage is a tissue on the end of the bones that allows joints surfaces to slide against one another with very little friction. Arthritis is the deterioration or “wearing out” of this cartilage. When arthritis affects the big toe or hallux, it is almost always at the metatarsophalangeal (MTP) joint, near the ball of the foot where the toe joins the foot itself. Hallux arthritis causes stiffness in the joint that makes it hard to extend the joint so it may be difficult to lift the toe away from the floor. Bone spurs or growths may occur at the top of the joint making it bulky and lumpy. The tenderness is usually at the top of the toe. The toe is especially painful on extension so that that the pain is greatest at the very end of the step when weight is applied directly to the ball of the foot. If the lumps on the top of the toe become big enough, the top of the shoe may hit it, causing pain. Hallux arthritis is often confused with gout and bunions. It can usually be diagnosed easily with an x-ray. No one knows for sure why arthritis develops in one person and not another. Quite a bit of it seems to be genetic. The stiffness of the bone, the shape of the joint—all of these may change the rate of wear of the joint. One important contributor is the stiffness of the ligaments supporting the big toe. If the ligaments of the toe become very tight when the toe is extended, a great deal of pressure develops on the toe of the toe joint. The base of the proximal phalanx essentially digs into the top of the metatarsal, wearing the cartilage away and causing the bone to develop spurs. The joint wear pattern seen at surgery is fairly predictable and seems to reflect this. Another potential contribution is the amount of pressure that is placed on the front of the foot. Measurements of pressure on the front of the foot in people with hallux osteoarthritis are higher than in people without hallux osteoarthritis. Commonly a bone spur (white arrow) will form on the top of the arthritic big toe joint. This spur and the worn cartilage make it painful to extend the joint. Unfortunately, there is little that can be done to reverse the wear on the joint. However, a lot can be done to make the joint less painful and to avoid aggravating it. Non-steroidal anti-inflammatory medications such as ibuprofen and naprosyn are effective pain medications,but do little nothing to cure the arthritis or delay the deterioration. These medications also do not decrease the swelling or increase the motion in hallux. They are valuable ways of dealing with the pain of the osteoarthritis. One of the most important ways of limiting the aggravation of the joint is to limit the motion of the joint during activity. Selecting shoes that are stiff enough to prevent extending the joint are very helpful. Rocker-soled shoe are very effective in this regard. Orthotics can also be helpful in some circumstances. Rehabilitative exercises designed to promote ankle flexibility and postural training aimed at decreasing forefoot load are also very helpful. Do not attempt to increase the motion of the joint by forcing it into extension. This is likely to intensify the pain and is unlikely to increase the motion. Surgical reconstruction is available to whose pain is resistant to these simple measures. 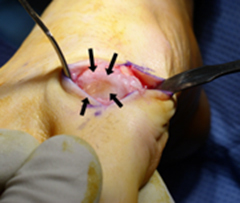 There are basically five different ways of surgically approaching hallux arthritis: osteotomy, resection of portions of the joint, fusion, resection arthroplasty and implant arthroplasty.